By the late 1970s, technology was making everything bigger and faster. Skyscrapers were reaching farther into the sky than ever before. The space shuttle was preparing for its maiden voyage. The joint British-French Concorde was transporting passengers across the Atlantic at supersonic speeds. Jumbo jets like the Boeing 747 and the McDonnell-Douglas DC-10 were carrying more passengers farther and faster than was dreamed possible a generation before. But with bigger and faster planes came bigger and more painful tragedies. Disaster came to Florida in 1972 with the crash of Eastern Airlines flight 401, a Lockheed L-1011 wide-body jet which crashed into the Everglades, killing 101. In India in 1978 a 747 crashed into the Arabian Sea killing 213. The year before, 583 people had died when two 747s collided in the fog on a runway in the Canary Islands. Illinois’ turn came on a sunny Friday afternoon at the start of the Memorial Day weekend in 1979. American Airlines flight 191 was a DC-10 scheduled to fly from Chicago-O’Hare to Los Angeles on May 25, 1979. The O-Hare-LAX flight was a common one for American’s fleet of DC-10s. In fact, it had been one of the first commercial routes flown by the DC-10 when it entered service in 1971. The DC-10 was McDonnell-Douglas’ long-range commercial airliner. The wide-body aircraft is easiest to recognize from its three-engine design: one under each wing and one in the tail. Over the years, a number of variations on the DC-10 airframe were introduced, with different maximum passenger loads and maximum ranges. A cargo version was built and is still in use by FedEx among others, and an aerial refueling tanker, the KC-10, is operated by the U.S. Air Force. By the late 1970s, DC-10s were a common sight at airports in America and the rest of the world. But the DC-10 had also suffered a high-profile accident in the not-too-distant past. The plane had a cargo door design that was different from most others. It was possible for the cargo door to appear closed, both to the eye and to the pilot’s indicator panel, without being fully secured. 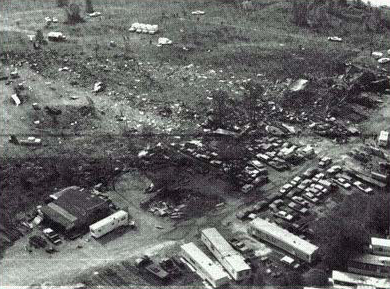 This led to an explosive decompression of a Turkish Airlines DC-10 outside Paris in 1974 in which 346 people were killed. The Federal Aviation Administration (FAA) ordered modifications after that crash, and there were no more cargo door issues with the DC-10. Over the next five years, the Paris crash faded from memory and the plane built a reputation as a sturdy, reliable long-haul aircraft. That Friday afternoon, 271 passengers and crew boarded the American Airlines flight to Los Angeles. Captain Walter Lux was an experienced pilot with thousands of hours in the DC-10. The rest of the flight crew was similarly qualified. Everything seemed normal to those on board, many of whom must have been looking forward to an enjoyable Memorial Day weekend in California. As the plane started accelerating down the runway, the cockpit voice recorder picked up a bang and an exclamation from a crew member. Then it cut off. Underneath the left wing, the number one engine and its pylon had violently detached and flipped up and over the wing, tearing off a section of the leading edge of the wing in the process. The engine debris slammed back onto the runway as the plane lifted off the ground. The detached engine had powered much of the plane’s electrical system, including the pilot’s controls and the voice recorder. The damage also included a significant part of the plane’s hydraulics system, vital for controlling the aircraft. With the loss of power to the recorders, it was impossible for investigators to determine exactly what happened on the flight deck in those next seconds. There were procedures in place for this sort of situation, but they depended on the flight crew’s ability to diagnose the problem and take steps to deal with it. Just 300 feet off the ground, with instruments out of service and unable to see the damaged section of the wing due to the flight deck’s window configuration, the crew’s task was extremely difficult if not impossible. There just wasn’t time: less than one minute elapsed before the end. According to eyewitnesses on the ground, the damaged plane began to roll to the left, finally reaching an angle of 112 degrees before losing altitude and crashing less than a mile from the end of the runway near the intersection of Touhy Avenue and Mount Prospect Road at the boundary of Des Plaines and Elk Grove Village. Fire and rescue crews from the airport and the surrounding towns raced to the scene, and area hospitals implemented their disaster protocols. 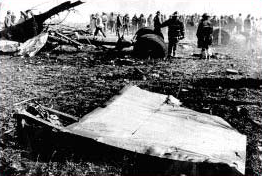 But then the terrible truth became known: all 271 persons on board and two on the ground had been killed. The questions began immediately. What had happened? And why? The National Transportation Safety Board (NTSB) launched an exhaustive investigation into the cause of the crash. The fact that the lost engine was still attached to its pylon pointed investigators toward a major structural failure. A closer inspection of the pylon found pre-existing damage that was traced back to an engine change done at a maintenance facility two months earlier. The plane’s manufacturer, McDonnell Douglas, recommended that when an engine and pylon were removed for routine maintenance, the engine should be detached first and then the pylon. But several airlines used a time-saving procedure that involved removing both the engine and the pylon at the same time. These methods relied on the use of a crane or a forklift to support the weight of the engine during the removal process. 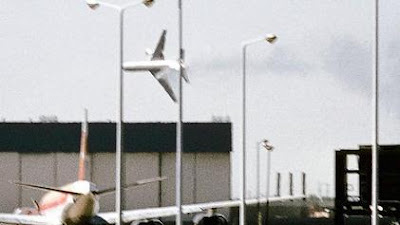 When the left engine and pylon on the plane that would become American 191 were removed for maintenance, a mistake was made in the process which resulted in damage at the point where the pylon was attached to the wing. The initial damage was so slight that inspectors did not detect it, but over the course of the next two months the enormous pressure of takeoffs caused cracks to develop and expand, making a failure of the connection inevitable. The FAA grounded all DC-10s a few days after the crash while the investigation was underway. Two more DC-10s crashed that same year; one in Mexico and another while on a sightseeing flight over Antarctica; but both were determined to have been due to human error, not the aircraft. The finding that the O’Hare crash was caused by “improper maintenance” rather than a flaw with the aircraft itself helped to restore some of the DC-10’s damaged reputation, but brought little comfort to the families of those who were lost. The maintenance procedure at issue was banned by the FAA, and American Airlines was fined for its role. Flight 191 Memorial in Des Plaines. Photo from the Des Plaines Park District. Nearly 30 years after the crash, a group of sixth graders at Decatur Classical School in Chicago started an effort for a memorial to the victims of Flight 191. Their efforts were motivated in part by the news that their assistant principal had lost both of her parents in the crash. 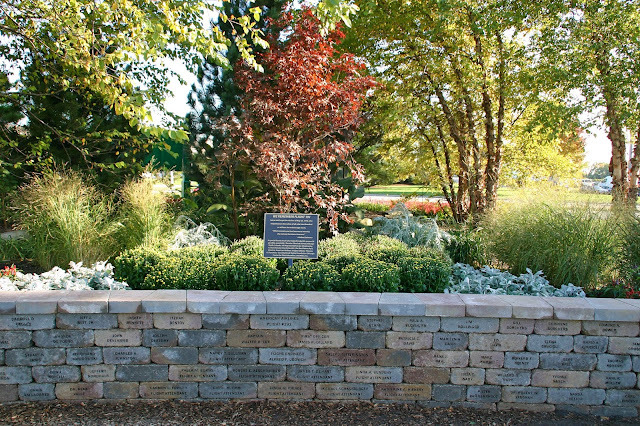 In 2011, a memorial displaying bricks with the names of each of the 273 victims was dedicated in Lake Park near the intersection of Lee and Touhy Avenues in Des Plaines, not far from the crash site. It stands as a tribute to those lost in Illinois’ worst aviation disaster, and a tragedy that was the deadliest plane crash in American history until it was eclipsed on September 11, 2001.